It's a great pleasure to have this long-dreamed-of Procol Harum release to review: and though there are one or two criticisms of the product in what follows, nobody should feel deterred from buying it. 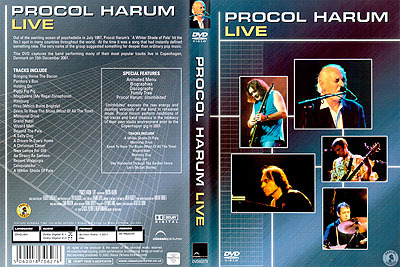 It contains band-footage – both concert and rehearsal – to die for, and the sound is absolutely excellent. Everyone who reads this will want a copy, and it is available from the Shine On merchandise page (order and pay online) at a competitive price. First of all, the repertoire and the performance. 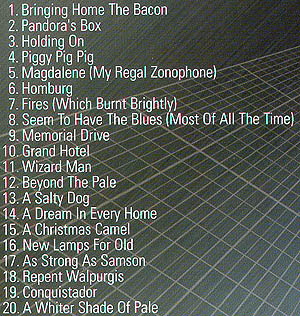 Procol played Copenhagen on 15 December 2001 – numerous concert reviews and pictures are here – for about 100 minutes, a roster of fine songs, classics, rarities, and a couple that some might term 'fillers': Bringing Home the Bacon, Pandora's Box, Holding On, Piggy Pig Pig, Magdalene (My Regal Zonophone), Homburg, Fires (Which Burnt Brightly), Seem To Have the Blues (Most of All the Time) [sic], Memorial Drive, Grand Hotel, Wizard Man, Beyond the Pale, A Salty Dog, A Dream in Every Home, A Christmas Camel, New Lamps For Old, As Strong as Samson, Repent Walpurgis, Conquistador, A Whiter Shade of Pale. 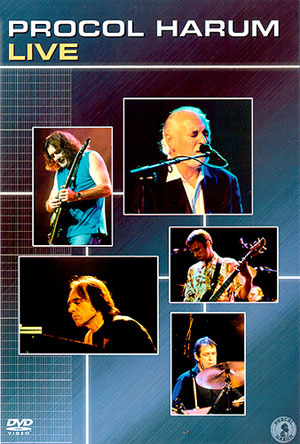 The line-up is of course the now-stable 21st century Procol, who have been together since 1993, as Gary observes in one of his commentaries to camera: Gary Brooker, piano; Mark Brzezicki, drums; Matthew Fisher, Hammond organ; Matt Pegg, bass; Geoff Whitehorn, guitar. Elsewhere in the video we also get a brief appearance from Keith Reid, words. The playing is of course elegant and sturdy, and Gary is in excellent voice; the band are arguably playing safe for the cameras, which are everywhere, and in this respect the DVD is unsurpassable. Superb, intelligent camera-work from the Danish Channel 4 team means that we see long, detailed shots of each musician in turn. As Gary Brooker observed (during a recent wedding-party), 'It's worth it just to see what Fisher actually plays' – and the same could be said for each player. The detailed work put in by each Procoler can be observed as never before: and if you want to know the exact Hammond registration for AWSoP, wait for an over-the-shoulder shot and reach for the pause button! [Guitar-fans are perhaps less well-served, however: see here]. There's a lot more inter-song banter from Gary than was originally broadcast on Danish television, so your off-air video-tape of that – movie clip and stills here – may be safely binned. There are one or two tiny edits on this DVD too, so that the odd moment's mishap is eliminated, without compromising the honesty of the live show. The package is appealing without being spectacular. The blurb on the back of the box informs the uninitiated that 'Out of the swirling ocean of psychedelia in July [sic] 1967, A Whiter Shade of Pale hit the No.1 spot in many countries throughout the world. At the time it was a song that had instantly defined something new. The very name of the group suggested something far deeper than ordinary pop music.' (More in this vein may be found on the Classic Pictures website). It's a relief to find that Classic Pictures didn't go with the provisional front cover (illustrated, right) that appeared a while ago on their 'forthcoming releases' page. But it's a pity there's no credit for photographer Jutta Buedel, whose concert pictures adorn the published cover. 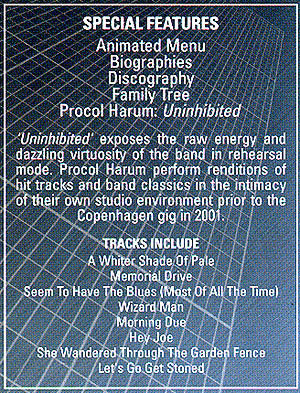 The same sloppiness extends to some of the 'Extras' on the disc: the Discography omits singles, and lists only one of the Procol live albums: there's no mention of Live at the BBC nor of the excellent One More Time, which does a disservice to new fans as well as to the band themselves. More galling is the band family tree, which has been poorly adapted from the fine originals at this 'Beyond the Pale'. Classic Pictures originally approached BtP for permission to use these, and we agreed to revise them specially for the DVD. Jonas and Frans put in some long hours, yet in fact Classic's left hand seems not to have known what its right hand was doing, and an earlier, incomplete version was used – with added errors (did Henry Spinetti play at Guildford 2000 … !). So the family tree here comes in a most user-unfriendly form, making the comparison of old and new generations of the band extremely difficult – and no authoring credit is offered. It would be nice to see this revised (at least corrected) before the DVD is reissued for the US market, and it would be nice to see a thank-you as well. BtP was asked, by one Procol fan, if the package were intended to look like a bootleg! The whole caboodle should surely have been offered for checking by someone in the know, either at Procol Management or perhaps at BtP. Diane 'Rolf' does get a mention on screen, but the spelling there tells us that she didn't get to proof-read anything! But to be honest such matters are dwarfed by the interest of the section named 'Uninhibited', described by Gary as 'an Easter-egg', that's to say, a stowaway relative to the main feature. 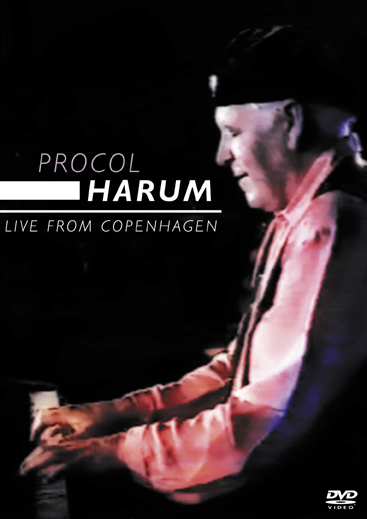 This takes us into Gary's barn for an informal rehearsal and chat, featuring a handful of songs heard in the Copenhagen show, some rarely performed items, and some rather astonishing non-Procol pieces that seem just to appear out of thin air. This is magic stuff: after all, most people who buy this disc will have seen the band in concert (albeit not in such splendid close-up) but how many of us have sat in on a session in Gary's barn and seen how the band go about their preparations for a gig? No date is given for this 'uninhibited' section. We hear occasional comments from Matthew to the effect that 'we won't be playing that one', yet this rehearsal can't have been all that close to the time of the Copenhagen performance … unless Mark Brzezicki's beard suddenly grew at a prodigious rate. Be that as it may, it's a treat to hear the band running through some pieces, perched on their Marshalls or wedged (in Fisher's case) between two Hammond organs (the B3 adorned with three coffee-mugs). Gary himself sits between two pianos, his RD-600 in constant use and his black acoustic grand regrettably tenantless. The other musicians face him and pick up his cues, his vocal drumming effects (specially in Morning Due [sic] … which Procol probably played last on the BBC in June 1967. Incidentally Gary seems to credit this song to Tim Rose, though it was actually written by Bonnie Dobson). He specifies particular rhythmic patterns not in terms of crotchets, quavers and so on (nor whole-notes and half-notes, for our US readers!) but in terms of the timing of chanted items from Indian Restaurant menus: 'Chicken Tikka' and so forth … which lends weight to the idea that the title Piggy Pig Pig derived originally from some similar rhythmical mnemonic. So … one or two quibbles, but fundamentally the message is this: hats off to Classic Pictures for having the good sense to put out a Procol DVD of such high quality concert footage for the public at large, and such interesting rehearsal material for us fanoraks (or 'fanorakademics', as Dr Cameron lately quipped). 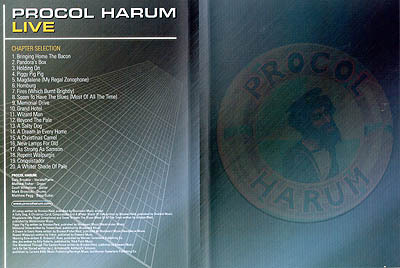 If you are a Procol Harum fan, you surely cannot contemplate living much longer without your own copy of this recording: its list price is 19.99 pounds. It should be in your local MCV or HMV shop pretty soon … if not, hassle them to order it. You can also get it from Amazon UK by using this direct link or from the Shine On merchandise page at 17 pounds plus postage.